Professional Writing Services | Improve your chances to get through initial screening of Interviews! Professional Writing Services (Cv / Resume, Cover Letter, Professional Branding over LinkedIn) | Improve your chance(s) to get through initial screening of Interviews! Gulf-Recruitments.com have partnered with CV Shapers the leading Writing Services provider, to offer you end to end of Career Solutions / Professional Development Services - Services (CV, Cover Letter, Professional branding using LinkedIn), Career Counselling, Interview Job training & Coaching and Placement assistance to facilitate career exploration for professionals. CV Shapers is a young and a dynamic organization based out of New Delhi, India and are assisting professionals for more than 4 years now in various related areas in India, Middle East, Gulf and APAC. 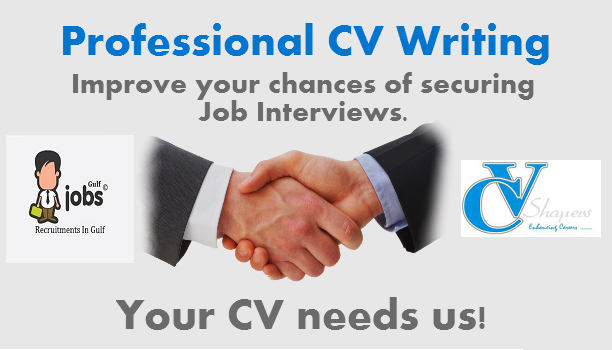 CV Shapers aim is to deliver tailored made, high quality and cost-effective writing solutions to the customers across the globe and have been writing 450+ profiles on an average each month. Many resume sites have testimonial pages. But have you ever wondered if the testimonials on these websites are real? Or recent? We don’t want you to wonder. If you want to read some of the testimonials they have accumulated over sometime, please do so. But don’t take our word for it. Read their Facebook page / LinkedIn page and see what our customers say about them, in their own words and in real time. Please fill in the form below. You will be contacted immediately by our Support staff within next 1 hour. CV Shapers aim is to deliver tailored made, high quality and cost-effective writing solutions to the customers across the globe. Our mission is to be the leading providers of personal branding profiles to Professionals, thereby facilitating their chances of getting into the job & fulfilling their Career goals. As a part of the Process, we request professionals to send across their profile (As-Is) to us here. Team gives it a due consideration and then requests you for your time over the Skype, preferably 30 – 45 minutes to understand your profile in length & then kick start with the CV development process. Once we are through with the discussion, our TAT is 3 days and we help you with the draft version within stipulated TAT. You can have a review & we again connect to understand your inputs, incorporating the same and assisting you with the final version by closing on the open loops. We are into Professional branding as well assisting professionals in various related areas. We can help you develop a profile that will help achieve noticeable results and also substantial increases in appearance of your profile to recruiters when they search for specific keywords basis your skills. • Advice and guidance to build your LinkedIn reputation and networking: Endorsements, recommendations, Groups and Network Connections.